The sub regional strategy consistently states that one of its main aims is to create a clear identity for the sub region. The aim is to forge and enhance closer cultural cross border links between North East Wales and the North West of England to create this distinct identity. The links that they are attempting to create are artificial but there is a clear agenda behind this thinking. In order to market places like Wrecsam as a retail centre and as a ‘Cheshire location’ for potential new residents and those who want to set up business, the sub regional strategy and the Mersey Dee Alliance have identified a need to change perceptions of North East Wales. This change of perception essentially revolves around reinventing the image of strategic sites identified in the plan (Wrecsam being one and the example we will discuss here). Welsh identity is identified in draft versions of the plan as being a ‘threat’. It is seen as a barrier to the implementation of the plan. Draft versions of the plan also make reference to the fact that people in North East Wales are very ‘attached’ to their welsh identity and heritage. This is not conducive to the economic expansion that is planned and therefore why it is identified as a threat, this is also a possible reason why the plans have been kept from the public. As can be seen from the research done by marketing companies such as Thinking Place (see the information below), consultations on the image of Wrecsam in particular were sought from people from the North West of England. The results were that the image of Wrecsam (in the opinion of people from the North West of England), was that it wasn’t a desirable place to come and live or to set up business. What is desirable is a Cheshire address and image. The image of Wrecsam presented by Thinking Place is based on absolute ignorance, is highly stereotypical and even prejudicial. It is certainly not based on any genuine knowledge of the local area. The aim of place marketing is to create a new vision for towns like Wrecsam, ignoring their historical situation and creating something new that is easier and more appealing to market as part of Cheshire. Place marketing is a key aim of the Mersey Dee Alliance (MDA), the organisation implementing the plan. They aim to do this by deploying something called a ‘coherence of place marketing’ (joint marketing strategy) across the new sub region. In Wrecsam, this aim materialised late last year via a branding/Place marketing strategy to create a new vision for the town, put forward from an English consultancy firm called Thinking Place. Costing £26,000 of public money and with proposals for a further £14,000 in the future, the strategy was presented to local councillors in October 2008. The aim of the branding exercise was solely to import businesses and people into Wrecsam from the North West of England, rather than to create business opportunities for local people or to even address local needs. The tag lines to front the strategy were ‘no borders’ and ‘no compromise’. 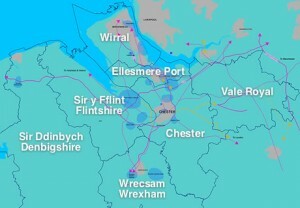 The strategy proposed changing the identity of Wrecsam in order to make it more acceptable for investment by a middle class business culture. To ‘Improve the image, reputation and experience of Wrexham”. It identified ‘a need to raise aspirations‘, ‘raise expectations‘ and to ‘raise quality and standards”. In the presentation Thinking Place state that “Wrecsam could be either English or welsh, it is sometimes welsh, sometimes English“. As stated earlier, one of the key tag lines for the strategy is ‘no borders’. Thinking Place go on to explain the reasoning for their choice “ No borders – about our nationality, our geography, our reach’. They state that Wrexham is a place with no borders, mentally or geographically. The idea of creating a vision for Wrecsam has been discussed before. In February 2007, Wrecsam council published another study called ‘Developing Wrexham‘s Sense of Place‘, this time prepared by Angharad Wynne marketing and communications. After discovering this piece of work, the people’s council are amazed to learn that this much more positive and locally distinct vision is still sat on a shelf. Instead if implemented a branding vision actually based on the town and its people, it was instead dropped and a new vision commissioned in line with the West Cheshire plan. Angharad Wynnes work focuses on Wrecsams Welsh identity, character and uniqueness, assets the MDA and sub regional strategy apparently do not consider useful to market.